There are 8 posts filed in Architecture (this is page 1 of 1). The other day I was asked by a coworker the difference between a proxy and a reverse-proxy. These are 2 types of servers that are largely used in front of an application server. Many companies and schools filter their internal network through proxies. So I made this drawing, I think it should come handy to a lot of people. Many people are familiar with the proxy server that they need to configure in their browser to access the internet. But few people are familiar with the reverse-proxy server. 1) The proxy server’s main job is to cache pages so it serves them if the client asks them again. 2) The reverse-proxy server’s main job is to secure the servers as it takes the incoming requests from the internet and forwards them to the servers. Other jobs are : load balancing, filtering and also caching. The reverse-proxy can be located in a demilitarized zone (DMZ), that is a very secured area, between 2 firewalls for instance. if the firewall is removed, the client still can access the internet. If the proxy is removed, the client cannot access the internet. 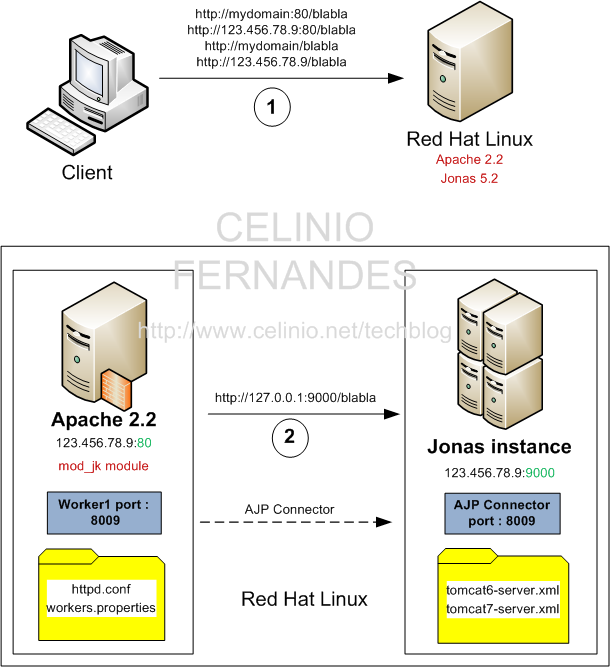 Today I wanted to experiment some load balancing with JBoss and Apache. For that I needed to run 2 JBoss servers on one single machine. Of course if you run both servers at the same time, you will get errors such as “address already in use” because of services running on the same ports in both servers. It turns out that you need to modify the D:\jboss-6.0.0.20100721-M4-Server1\server\default\conf\bindingservice.beans\META-INF\bindings-jboss-beans.xml file to avoid same port conflicts. So I added 100 to all ports defined in that file, for server 1. For server 2, I only modified the HTTP WEB SERVER port because port 8080 is already taken by Oracle. There is no need to modify the D:\jboss-6.0.0.20100721-M4-Server1\server\default\deploy\jbossweb.sar\server.xml file. Running multiple instances of a single JBoss server is a different story. More information can be found here (ServiceBindingManager) and here . 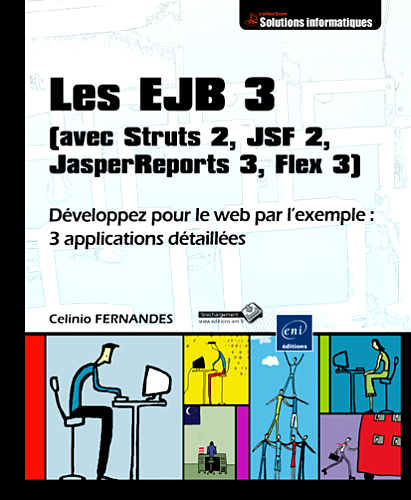 Here is another memento I wrote to remember the different approaches when writing EJB 3 or Web services. Web Services contract first : in the top-down scenario, the developer first creates or is given the WSDL file for the service, and then must create a component to implement the operations. First you create a Java bean or EJB bean and then use the Web services wizard to create the WSDL file and Web service. In this case the starting point consists of both the WSDL file and the implementation component, and the developer must create additional support code that maps between the two.